If you are considering visiting Morocco and want to visit a city that truly captures the spirit and culture of the country, visit Fes. The city of Fes, Morocco's third largest city, is home to over one million people. It was founded in the 8th century, and still has a distinct traditional charm to it. During our visit, we went on a half-day tour of Fes with Morocco Easy Tours. We started our tour with a stop at the famous Royal Palace. Although, it isn't open to the public, its majestic doors are enough to attract plenty of visitors. There are 7 stunning brass doors that mark the entrance to the palace. Surrounding the doors are beautiful tile work "zelligi" and carved cedar wood. The current King of Morocco stays in the Royal Palace during his visits to Fes. I can only imagine how beautiful the palace is on the inside! The Blue Gate of Fes' lofty entryway with its elegant mosaic tiles is the most recognizable portal to the old medina, Fez el-Bali. The side of the gate that welcomes visitors is blue, which symbolizes the color of Fes. When you pass through the entryway, you'll see the side that faces the medina is green-the color of Islam. Roaming through the alleyways of the old medina was my favorite part of the tour. The old medina is the largest surviving medieval city in the world. It is also an urban car-free zone, where cars are replaced by donkeys transporting goods. Once you pass through the Blue Gate, you will come across two main alleyways into the medina, the Tala’a Kbira and Tala’a Sghira. However, it really doesn't matter which one you take. With 10,000 alleys and over 20 entrances and exits, as a visitor, getting lost in the old medina is inevitable. We arrived early morning, the shopkeepers were preparing for their day by washing the ground. One thing our guide Hassan emphasized as soon as we entered the medina, was that the medina isn't just filled with souks (markets), it's a place where over 150,000 people live. 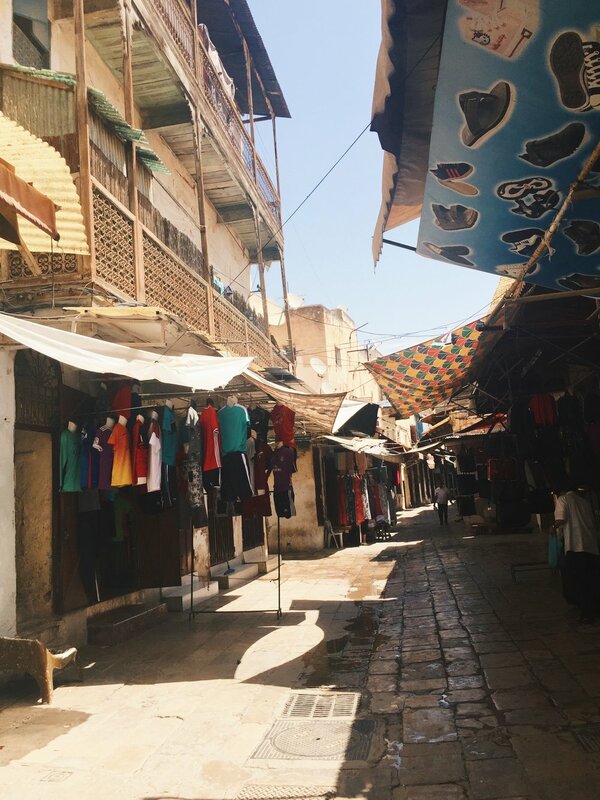 I really enjoyed being guided through the medina with Hassan because he was born and raised there and provided us with a lot insight into its history, that we wouldn't have received exploring on our own. I also loved watching him interact with his friends. It seemed like Hassan knew 90% of the people there! Al Karawiyyin is located in the old medina, and is home to the oldest university in the world, dating back to 859. It was founded by Fatima al Fihri, who spent all of her inheritance on this endeavor. It was originally created as a mosque, with a madrasa, an associated mosque school. Its initial focus was religious instruction and Qu'ran memorization, but later the curriculum expanded into Arabic grammar, music, Sufism, medicine, and astronomy. In 1963 it joined the modern state university system. The school educates students from all over the world. Fes is well known for its leather products and is home to three ancient leather tanneries. The Chouara Tannery, the largest and the oldest, is close to 1,000 years old. What makes Chouara so fascinating is that high quality leather goods are all created manually, without the need of modern machinery. The process hasn't change much since the medieval times. The stone vessels are filled with an array of dyes and various liquids. The men stand waist deep in the dyes, working under the hot sun, looking after the hides that are soaked in the vessels. Art Naji is a ceramic pottery shop and factory. Throughout my time in Morocco, I saw exquisite ceramic work everywhere. It was a fun experience to go to this factory and see how these masterpieces are created manually. The fact that whole production process, cutting tiles, chipping mosaic and paintwork was done without machines gave me a higher level of appreciation for their craftmanship. 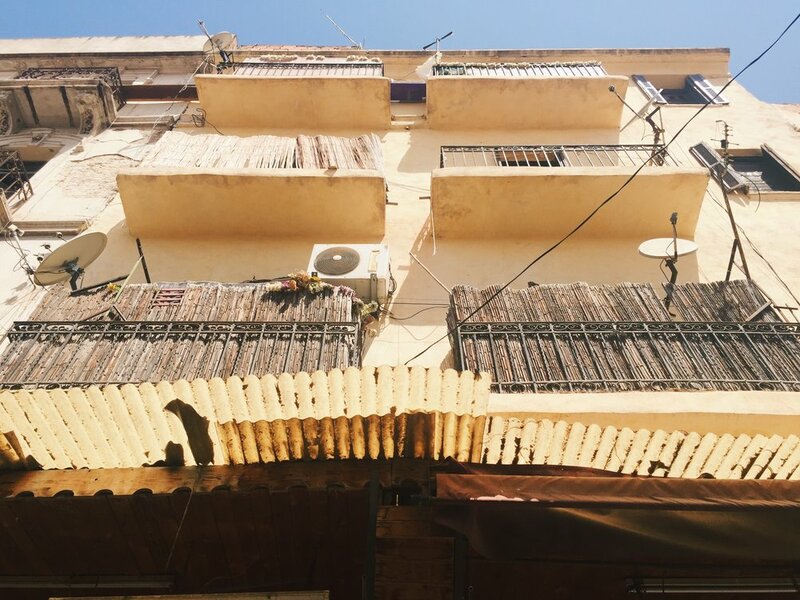 After a half-day of exploring the Fes medina and surrounding areas, there was nothing better than getting up at the crack of dawn to catch a sunrise on the rooftop of my riad. The panoramic view of the city was incredible and it provided me with a meditative space to reflect on my experience. Have you visited Fes? What was your favorite sight? If you are planning a visit, what are you looking forward to seeing?